I had a lovely day yesterday learning Leiko Uchi’s pine needle technique. My biggest worry was that I would find laying out the ‘needles’ difficult and time consuming, instead, while they did take a lot of time in preparation the task was neither boring nor frustrating at all! My finished pine needle scarf! Seeing all Leiko’s beautiful samples spurred me on and I was thrilled by the end of the day with my beautiful, soft and ultra flexible scarf. 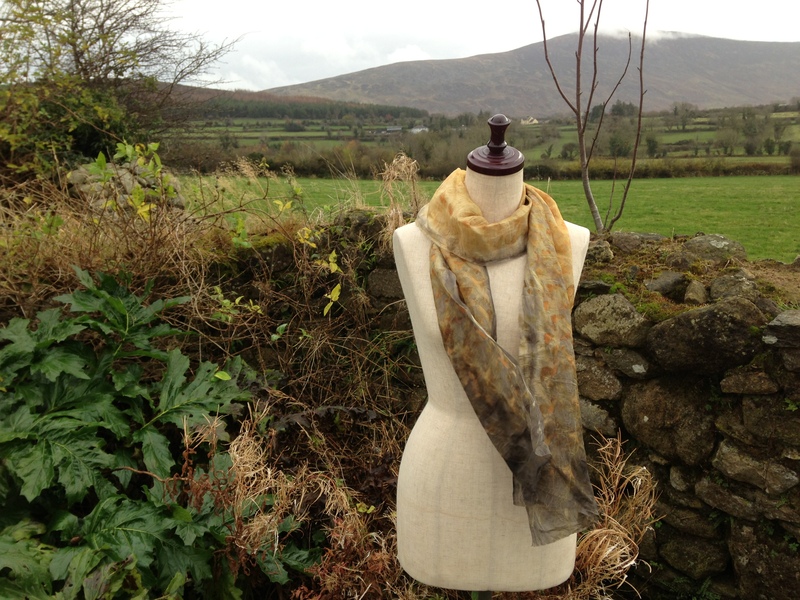 It was also fascinating working with materials I don’t often carry in stock, gorgeous gold coloured 50/50 silk/ultrafine merino tops, a rich green 40/60 blend and a dark green plain merino for the body of the scarf. Leiko dyed all these fibres herself and I loved the sympathetic way the colours all blended together. The piece was laid out measuring 2.70m (a tad under 9 feet) and ended up after felting at 1.6m (just over 5 feet), a lot of shrinkage!!! Because I laid a very fine gold line around the edge of one side and two different ends for interest, this scarf may be worn in loads of ways! Check out my new facebook album for more pictures and the details. It was a little breezy this morning taking pictures but a few people were asking for pictures of the silk I printed and dyed last week. 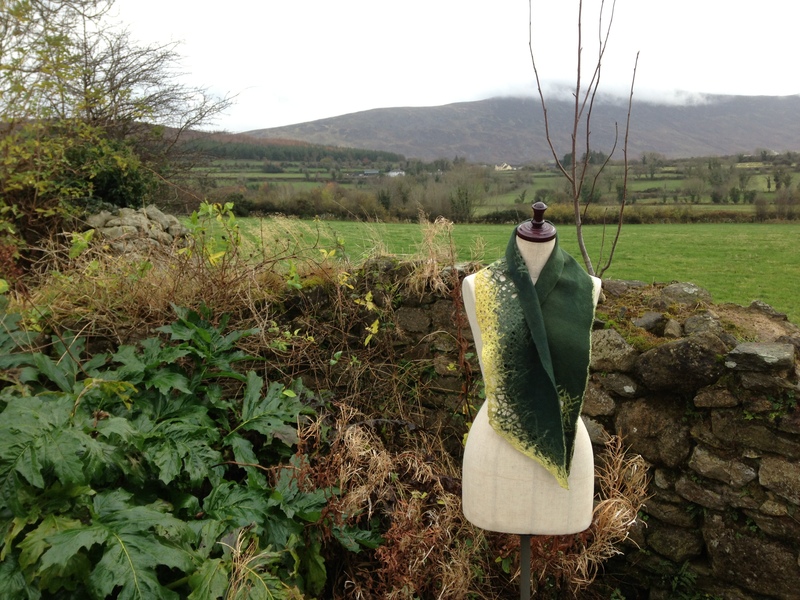 Here are just two pictures, a rolled edge chiffon scarf that will be left as is and a length of ponge silk which I’m going to nuno felt later in the week, both were dyed using a selection of eucalyptus leaves, onion skins and rusty metal. This entry was posted in Dying, Natural printing and dyeing, workshops and tagged Clasheen, Felt, Felting, Leiko Uchi, Leiko Uchiyama, nuno felt, oine needle felt by Nicola. Bookmark the permalink. Nicola – these are all beautiful! I must put a date in the diary to come over sometime next year to learn more about these techniques! 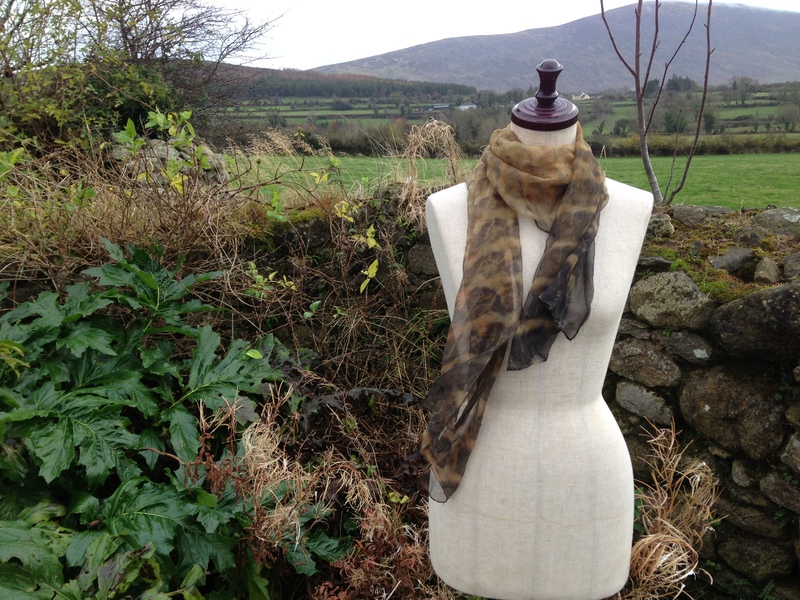 Love the pine needle scarf Nicola. All those prickles sound uncomfortable, but the end result (minus the needles!) is stunning! I really like your pine needle scarf! Lovely scarves, the new green one is wonderful, as I was walking up from the garden the ground was covered in newly fallen pine needles from a recent wind storm, and I thought of Leiko’s work .the ground looked like a piece of your scarf!